Hsieh’s work, titled “Pentagram Invasion”, rises to 20 feet in height, was inspired by the artist’s fascination with the extraterrestrial and the prospect of intelligent life elsewhere in the universe. He designed this art piece with a large-scale pentagram star which symbolizes the Christmas spirit made by plaid wood, plexiglass, LED light and other innovative materials on one side. Various alien species can be seen lurking around the side and on the platform itself. Each alien creature is hand-painted by the artist bringing more galactic fun to the art piece. 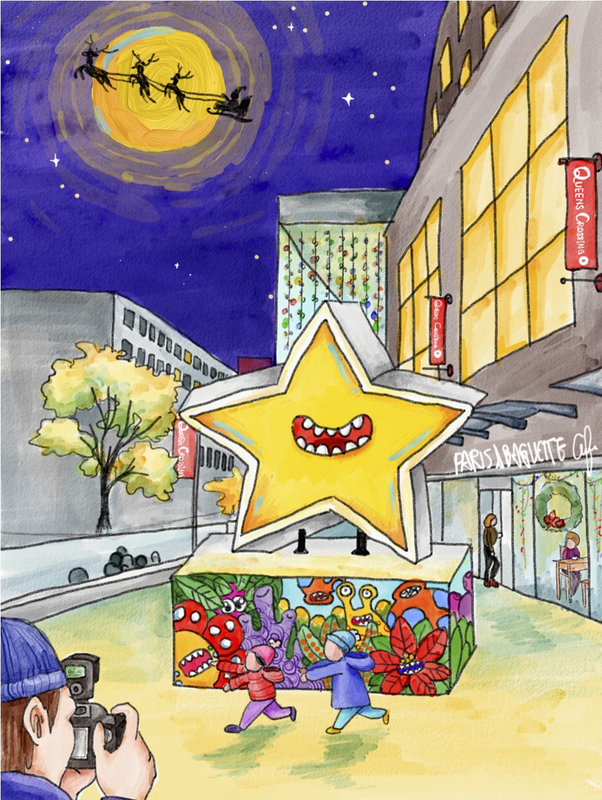 As the chief designer of one of the most “instagrammable” interactive exhibitions, Wonder World, in NYC earlier this summer, Hsieh tries to make the “Pentagram Invasion” the most popular Christmas installation on social media this winter. “Taking photos deemed ‘instagrammable’ is a current trend for millennials so we wanted to create something fun and eye-catching this year that would look great in person and in photos. Visitors are encouraged to post their photos with the installation and tag us on social media,” comments Wesley Sin, curator and marketing manager of F&T Group. On December 7th, the organizers invite the community at large to take part in their annual lighting ceremony celebrating Hsieh’s creation. Anticipated participants include Queens Borough President Melinda Katz, New York State Senator Toby Ann Stavisky, New York State Assemblyman Ron Kim, New York State Assemblywoman Nily Rozic, New York City Councilman Peter Koo, Miss New York USA 2018 Genesis Suero and Miss New York Teen USA 2018 Saige Guerin. There will also be a special live performance by popular singers and award-winning dance groups. Visitors can post their photos of the installation with the hashtag #QueensCrossing on multiple social media platforms (Facebook, Instagram, WeChat) from December 7th to January 31st and get the chance to win limited-edition Christmas charms from Pandora Jewelry. James Hsieh (b. 1990, Taiwan) earned his MFA in Fine Arts from Parsons the New School for Design. Born in the countryside of Taoyuan County, he spent his childhood exploring his grandfather’s large farm which drew his inspiration for Earth and nature from his experiences there. In his current work, he produces two dimensional art works that ultimately become large-scale installations by transforming soft felt and fabric into solid sculptures. His works have been shown at The Armory Show (New York), Westbeth Gallery (New York), Annmarie Sculpture Garden (Dowell), National Sculpture Society (Murrells), White Rabbit Gallery (Sydney), Songshan Cultural and Creative Park (Taipei) and much more (jameshsieh.com).